At the beginning of every reliability course I poll my students. 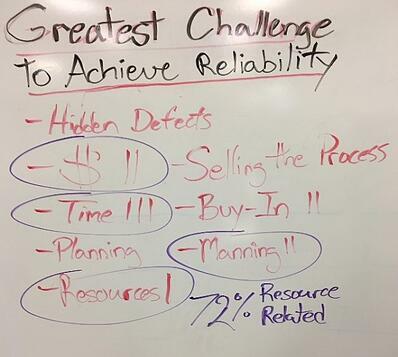 My favorite prompt, borrowed from Darrin Wikoff, is “In a word, capture the greatest constraint to achieving reliability?”. We go around the room and note each response onto a flipchart and add chicken scratches for duplicate answers. Over time I have found it typically looks like Figure 1. Thirteen out of eighteen responses (72%) are resource related. The image is from a Root Cause Analysis Course (RCA) I taught recently. The class consisted of Engineers, Technicians, Management, and Operators, a true cross section of manufacturing. The group was from a mature maintenance organization in automotive. But, over the last year experience has show that regardless of industry or maturity resources are believed to be the greatest threat to reliability. So, who is to blame? After the polls close the conversation devolves into the resource-allocation blame game with management as the usual suspect. Is this true? Not entirely, but it’s the perceived truth, and all opinion is rooted in some percentage of reality. Heavy is the head that wears the crown. To examine the resource dilemma, let us narrow our focus to training. Training devours money and man-hours. It is a resource sponge and when the budget needs trimming it’s low-hanging fat. It is very hard to defend when making difficult budgetary decisions. However, it must be protected. Training is included in every reliability plan in history. Training is essential to the continuous improvement of maintenance and reliability programs. After all 72% of your organization tell me it’s the greatest constraint. It is hard to argue with the abundance of personal testimony, but I disagree with the premise that resource scarcity is the root cause for cutting training. It is the systemic mishandling of training resources. Comparing my past training life experience as a US Army Officer with my life as a Maintenance and Reliability Coach. I will provide a systematic approach to developing your training program while attaining support and understanding from all levels of your organization. Systemic ailments require systemic cures. Focused training programs are based on business objectives (Mission). Maintenance organizations cannot achieve and sustain proficiency on every possible task. Therefore, Managers must selectively identify tasks that are essential to accomplishing the organization's Mission. As a young wide-eyed West Point graduate, I was eager to charge into battle. Eagerness made me susceptible to severe mistakes. I was over-zealous and wanted to train my men on every warrior task and drill. I unintentionally trained nothing to standard. We knew it all but were good at nothing. It was pure leadership failure. Army mentors and experience eventually taught me that training is the highest form of leadership. Legendary UCLA basketball coach John Wooden saw games as his day off. Because of his near perfect practice plans he knew after tip-off his team had everything they needed to execute the game plan. This approach led to 10 NCAA National Championships. Every Soldier knows the Mission. Every Soldier is trained to standard exclusively on Mission Essential Tasks. Regardless of conditions every Soldier can achieve the Mission. That’s it! Know and understand the desired outcome, train personnel to established standards on essential tasks so that in despite any constraint placed upon them the day is won. One of my Army mentors constantly reminded me “Conditions change, standards don’t!”. Prepare your organization to win despite a world rife with leadership turn-over, resource constraint, talent attrition, and a myriad of additional obstacles. Victory and survival depend on it. The late Steven Covey taught us to start your reliability training program with the end in mind. Define the objectives as a description of where you want to be at the end of the battle. Map the battle field, listing and aligning roles and responsibilities with the desired outcome. Provide troops with rally and touch points, minor goals and objectives. Make sure everyone knows where we are in the battle and is focused on the overall mission. I envision everyone reading this nodding in agreement. It’s leadership 101. The answers are known, but many fail due to systemic issues. 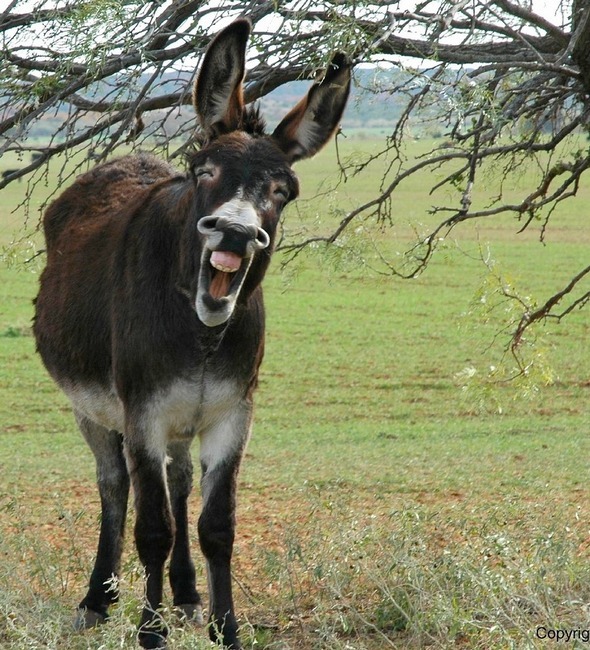 The most common being; poor planning, poor communication, lack of accountability, and zero follow through. If the path outlined is followed these pitfalls are avoided. Soldiers and employees will know the Mission as the purpose and motivation for training. 1. Reliability Plan: Develop a plan at a level (Lead Team) that facilitates coordination between departments considering overall business objectives. If the reliability plan doesn’t fit within the greater plan it changes, putting the training plan at risk, no matter how good it is. 2. 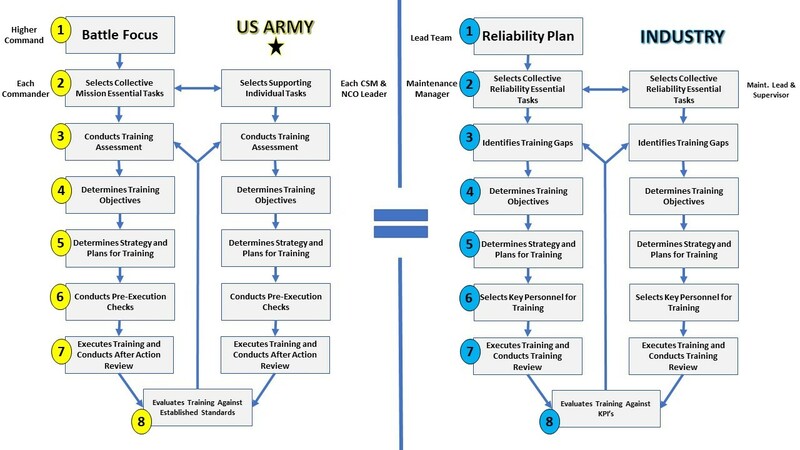 Select Reliability Essential Tasks: The Maintenance Manager selects reliability tasks that align with mission objectives from the Reliability Plan. There is only so much money and time. 3. Identify Training Gaps: Reliability Plans usually require more resources than available, making task selection critical. Skill deficiencies move tasks up the “essential”, more critical to business objectives list. Identify those tasks that have the fewest number of proficient resources. 4. Determine Training Objectives: Training doesn’t end when the bell rings. There must be quantifiable outcomes that equate to training success. Certifications, skills testing, or a roster of experts in various fields can be simple benchmarks to begin with. However, like military ranks or grades, the more effective training plans align task proficiency with performance evaluations, merit increases, and advancement. 5. 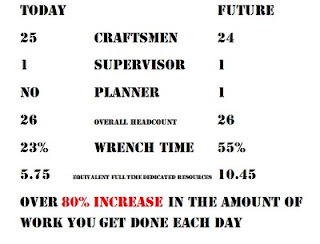 Determine Strategy and Plans for Training: Maintenance Managers balance the day to day and the training plan. They think through how many subject matter experts are required in each department or shift, and how many people can train at a certain time while sustaining operations. Operational risks must be mitigated. 6. Select Key Personnel for Training: You can’t train everyone, and you shouldn’t. There are many things to consider when selecting trainees. Do they need the skill to accomplish objectives? Is there already someone with the skill-set? Are they willing? Do they deserve the investment? It’s about bang for the buck. 7. Executes Training and Conducts Training Review: Leadership observes training and assess its value. If it doesn’t get you to where you want to be its not worth the money. Set milestones for each trainee, and actively engage the employee in the training plan to ensure the success of each milestone. Don’t wait until the end of the battle to determine if the plan was a success. 8. Evaluates Training Against KPI’s: This is probably the most over-looked step. A thoughtful approach was used to develop the training plan and select trainees. Remember the three objective training checklist. Metrics tell us if the Soldier understands the Mission, has been effectively trained for the Mission, and regardless of conditions the Soldier can achieve the Mission. Training KPI’s should measure if your essential training plan increased your organization’s mission readiness. “Conditions Change Standards Don’t! “. Training plans are based on the METL process gives the Soldier the best chance to survive in battle, and the unit the easiest path to victory. If the mission is understood a trained and motivated Soldier can achieve it in the absence of leadership and against the greatest odd. Give a Soldier distance, direction and motivation and they will take any hill. I know this to be true. The most effective reliability training programs include a blended approach of instruction, reinforcement and coaching. To error is human. But when the stakes are high, with error comes consequences. Training is critical and if neglected the repercussions are painful and at times tragic. What makes the US Military the most lethal fighting force in the world is its commitment to training. As in both war and industry, people are people and they can be trained in such a way that no objective is out of reach. Train hard, but more importantly train smart. The conquered train until they get it right, conquerors train until they can’t get it wrong.